type (default is msgall): This gives the type of search. status (default is all): This gives the status of result messages. lang (default from ULS): This gives the target language of the search as 2 letter code. e.g. de for German, fr for French and so on. grp (default is all): This gives the message group that's selected for the search. e.g. 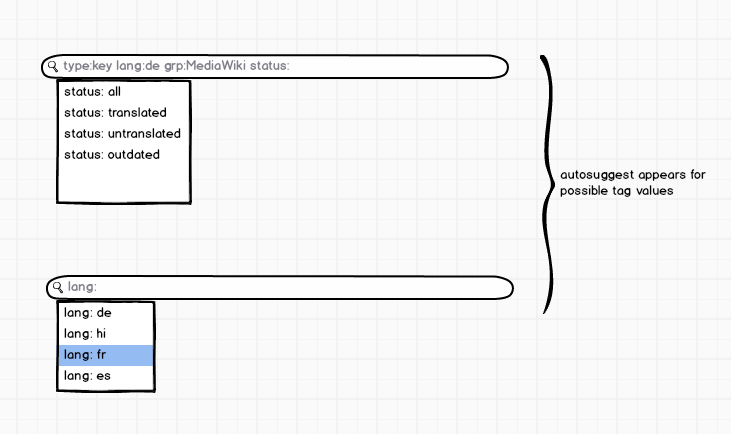 MediaWiki, MediaWiki (core) etc. case (default is false): This gives whether the search is case sensitive or not. Along with this, the search will have autosuggest for tag values. Phoenix303 raised the priority of this task from to Needs Triage. 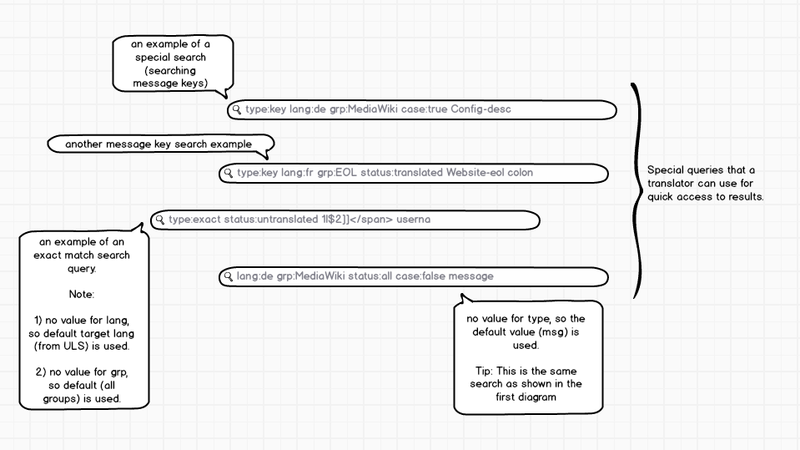 Phoenix303 added a project: MediaWiki-extensions-Translate. Phoenix303 added subscribers: Phoenix303, Nemo_bis, • Nikerabbit and 5 others. Phoenix303 set Security to None. I would like to see user scenarios backing these requirements. Personally I just search first and use the facets to filter down the results if needed. I personally think it will be nice being able set the values that currently appear in the facets after the search prior to the search. This is because I usually only want to get results for MediaWiki and in the language I translate to. 100% of my searches are messages I have seen live which need to be enhanced by some kind. I think it should be a good initiative. Will those search parameters appear as a (faded out) prompt (a.k.a. placeholder text) inside the field? Or are the mockups showing text typed by the user only? Either way, I think the search parameters should be discoverable right in the UI, without having to open a separate help page. Maybe it’s a good idea to add a help balloon next to the search field, which would contain the list of available parameters and a brief description of what they do. @Fito The mockup shows text entered by the user and thank you for suggestions to support placeholder text and help tooltip. This mockup is not a final design and more features can be added based on feedback.